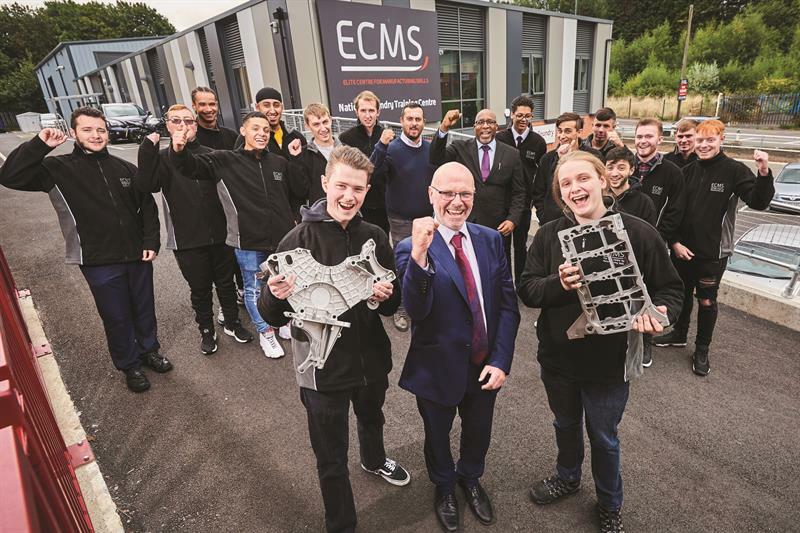 Launched in October 2018, the Elite Centre for Manufacturing Skills (ECMS) marks a significant investment in the future of high value manufacturing within the Black Country. Based on a hub-and-spoke model, dedicated training centres are now fully operational across the region, in collaboration with training providers and professional industry bodies, to both upskill employees and train new apprentices in metalforming and foundry skills. A crucial difference is that courses have been designed – and equipment specified – with the direct input of local employers. ECMS is a collaboration between the Black Country Local Enterprise Partnership (LEP), University of Wolverhampton, Dudley College, Cast Metals Federation (CMF), Confederation of British Metalforming (CBM), Institute of Cast Metals Engineers (ICME) and In-Comm Training. The ECMS hub is based at the University of Wolverhampton’s £100 million regeneration project at the city’s former Springfield Brewery. One of the spokes is a National Power Press and Tooling Centre, developed by the CBM and In-Comm Training. It is located at the latter’s facility in nearby Aldridge and focuses on the delivery of toolmaking apprenticeships and technical courses. A spoke at Dudley College majors on advanced welding training, while another in Tipton, designed and developed by the CMF and the ICME, has advanced casting facilities that will be used to deliver foundry training at all levels. Say Ian Fitzpatrick, chief executive at the ECMS: “This is a key strategic project for the Black Country, which links further education and higher education with local, regional and national employers. It’s well known that the manufacturing industry has an ageing workforce and that bespoke training courses – specifically matching industry requirements – can be difficult to source. We have listened carefully to what industry needs and, together with our partners, have designed manufacturing facilities equipped with world class equipment. Apprentices will be employed by local businesses and enrolled on education programmes with the University of Wolverhampton, Dudley College or In-Comm Training. Attendance at an ECMS spoke can vary from one day a week through to block release, part time and full time, depending on employer requirements. For those aged between 16 and 18 when they start their apprenticeship training programme, there is no charge to the learner or his/her employer. Funding for the programme is claimed by the college directly from the UK government. All courses meet the new apprenticeship standards and a variety of delivery models is available. The Black Country LEP approved £8.5 million for the project, while the partners have stumped up £4 million. One of the key partners is In-Comm Training (https://is.gd/legija), which hosts the £1.4 million ECMS National Power Press and Tooling Centre at its Aldridge facility. Here, the team will deliver toolmaking apprenticeships and technical courses for more than 2,000 people. Apprenticeship training courses are currently being written and will focus on: tool and die making; tool and die maintenance; power press setting and operating; product design and development; and mechatronics. Within the facility can be found many recently installed machines, not least a full press line incorporating two 110 tonne C-frame presses, robot transfer and the latest decoiling equipment – all supplied by Bruderer UK (https://is.gd/vufeto) in conjunction with Worcester Presses (https://is.gd/amoxum). The line has been designed by the CBM and In-Comm Training so that apprentices can perform transfer, deep-draw and progression pressing, using the same equipment for each process. A £500,000 state-of-the-art high speed precision Bruderer BSTA-280 press will also be arriving shortly, with tooling supplied by Birmingham-based Brandauer. In addition, a facility that replicates an industrial toolroom is currently being planned, the centrepiece of which will be a press tool strip-down and build area with 1 tonne crane. In support, the facility will install a press brake from Amada (https://is.gd/otegup), along with a surface table fitted with a measuring arm from Faro (https://is.gd/ucivug), a surface grinder, lathe, turret mill, bandsaw and guillotine. Gareth Jones, joint managing director at In-Comm Training, says: “We want to create the skills base of the future; to do that we know it’s got to be heavily invested. Industry must play its part by allowing individuals time off the job. No other organisation in the Midlands is currently offering this kind of training facility and we are expecting demand to be huge, especially with toolmaking considered a dying art. “Geographically and collaboratively, the offer is very strong, and will hopefully help drive the local economy forward over the next 10-15 years,” he continues. “Unfortunately, there is still a perception that industry isn’t a great career and, although we are changing that, we need to paint a better picture of modern manufacturing. It’s robotics, it’s CADCAM systems, it’s precision CNC machines, it’s playing a role in making sure Formula One cars get faster, aeroplanes are lighter, people can walk again – all played out in bright factories and with great earning potential. In-Comm’s partner in the ECMS National Power Press and Tooling Centre is the CBM, and its director, Kevin Kirk, is equally enthused about ensuring the project succeeds: “We have been involved with the ECMS since its original conception. At the outset, we carried out a member survey to discover their training needs. The overall response was that they couldn’t get the training required from the existing market provision. Equally well-specified is the ECMS’ National Foundry Training Centre at Tipton, which newly-appointed technician instructor Craig Adams, himself an industry stalwart with 20 years’ experience, describes as “unique; there is nowhere else like this in the UK”. He continues: “Within the foundry industry, from technician level to manager, the average age is 59. For years there has been no succession planning, which has led to a fire-fighting situation, with retired guys becoming consultants to keep the industry ticking over. This facility aims to address these issues with courses written by the industry, for the industry. Courses at the National Foundry Training Centre focus on key areas such as patterns, cores, casting and CNC machining, as well as product design and software simulation. After year three, apprentices choose a specialism. There are already 28 students making use of the facility, but this number is expected to exceed 80 by Easter 2019. Out on the foundry floor there are Inductotherm (https://is.gd/iwecet) induction furnaces (25 kg capacity for iron and 20 kg capacity for aluminium) and air-set sand casting plant donated by Omega, while inside the sand laboratory is a SpectroMaxx metal analyser from Ametek (https://is.gd/ilotuh) and sand testing equipment from Simpson Technologies. The centrepiece of the pattern shop is an XYZ 500 LR vertical machining centre from XYZ Machine Tools (https://is.gd/kufaha). A 16-seat CAD and MAGMA software studio is also sited at Tipton, while two 3D printers are set to follow early next year. ECMS apprentices not only gain access to the National Power Press and Tooling Centre, but In-Comm’s entire Aldridge facility, which was the beneficiary of a £3 million extension in March 2018. The extension houses a number of newly installed machines supplied by Engineering Technology Group (https://is.gd/ibevej), including a Bridgeport GX1000 5-axis machining centre, a Bridgeport V710 3-axis machining centre and a Quaser MK630 machining centre served by Halter LoadAssistant automation. Among other recent arrivals are a Mitsubishi MV1200R wire EDM machine supplied by HK Technologies (https://is.gd/aliqum), a Global Classic CMM from Hexagon Manufacturing Intelligence (https://is.gd/daguku) and Z010 tensile testing and ZHV hardness testing equipment from Zwick Roell (https://is.gd/omaxeb). The 24,000 ft2 facility also comprises material handling and grinding capabilities, a 16-seater Mastercam (https://is.gd/ewezek) and CIMCO CADCAM studio, fluid power stations, an 18-booth TIG and MIG welding studio, a manual machine shop with 15 lathes and 15 mills, as well as a dedicated electrical and electronics section. "Things are happening to bridge the skills gap, but not many firms have thought about the competency gap, and that involves looking at equipping firms in the West Midlands with the technical and advanced skills they need to make the most of global opportunities," says joint managing director Gareth Jones. "We are helping SMEs gain access to applications engineers and state-of-the-art technology that will allow them to develop products and map processes prior to installing manufacturing cells in their factories. "This year we are 40% up on the number of apprenticeship starts against a national decline of 61%," he adds. "This statistic shows what happens when employers really get involved in developing the right skills and training provision. As a result, they are getting young people and staff who are not only fit for purpose, but fit for the future." Emphasising his point, among many local employers to sign up with In-Comm, which is rated by Ofsted as "outstanding", are Walsall Pressings, Stadco and Gestamp. Cannock-based Gestamp Tallent, which recently opened a second factory in Wolverhampton, currently has 11 apprentices at Aldridge on mechatronics and toolmaking courses. Gestamp is one of the world’s largest suppliers of stamped metal components for the automotive sector. The move is part of the company’s desire to bridge the skills gap and address an ageing workforce, with the plan to recruit another 30 apprentices over the next three years.